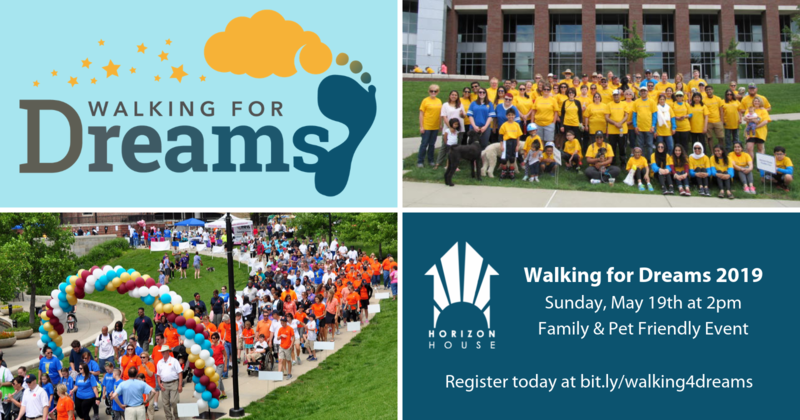 Walk for Team Horizon House at the 15th Annual Walking for Dreams 5K! Join us at this family and pet friendly event to impact our dream of helping homeless neighbors achieve self-sufficiency. Step 1: Set your individual or team goal. We are challenging individual walkers to raise $100 and teams to raise $1,000 or more! Step 2: Register to Walk. Complete your registration on this page. You can register as an individual or team captain. Step 3: Find sponsors. Ask family, friends, co-workers and others to support you. Suggest a flat donation of $10, $20 or more. Step 4: Collect Donations. Collect donations in person, through a Facebook fundraiser or create your own online fundraising page. Your sponsors can text the code "WALK4DREAMS" to 44-321 to donate online and give in your honor! Step 5: Attend the Walk. Bring your donations to registration by 2:00pm on Sunday, May 19 or mail them directly to Horizon House. Step 6: Celebrate. You are truly impacting our homeless neighbors! Questions about Walking for Dreams? (1) Banner sign at the Start Line of the walk! Recognition during event announcements (opening and closing remarks)! Recognition on the “day of” event flyer! Recognition on the event website (www.walkingfordreams.org)! Recognition in a Facebook post on the Walking for Dreams Facebook page! Sponsor logo on the (2) awarded plaques - displayed at the winning organization’s headquarters! Optional (provided by sponsor) - Space for 10x10 tent set-up for promotion! (1) Banner sign along the canal walk highlighting your sponsorship! Recognition in a Facebook post on the Walking for Dreams page! (1) Sign nearing the Finish Line of the walk! Recognition on “day of” event flyer! Logo included on the Hydration Station banner (located near half way point of walk)! Horizon House has partnered with Give Lively to securely process your online donation. This transaction will appear on your credit card statement as "Horizon House". This transaction is subject to Give Lively's Terms and Privacy.